Most of the atrei living in this region speak Nacateca. The Faroi people also live in these states. The Whites living in this region are descended from English settlers. 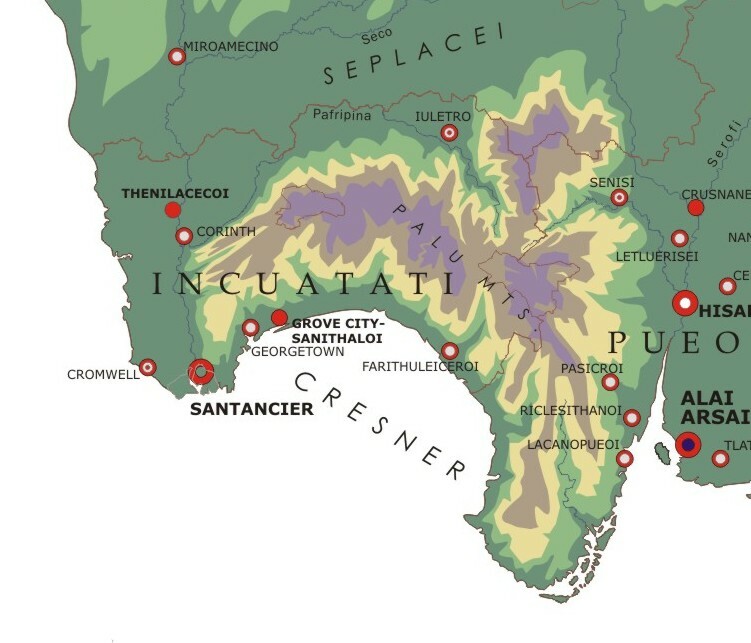 Incuatati -- subtropical, heavily forested Palu Mts., splendid beaches and resorts, a federation of different populations. Lampanira -- rural, pastoral, citrus orchards, ranching & herding, fine forests. 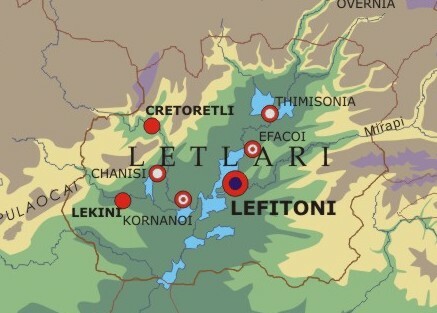 Letlari -- lake country, centered around Lefitoni, the nation's capital and 2nd largest city. Soleinia -- southern coast, flat & grassy, hot, big coastal mangrove swamps, beautiful beaches, very English. Pueoi -- south-central flat regions, cotton & sugar. Sanraniclai -- south-central, sparsely populated, where the Ifuno plateau meets the southern plain. Most of this region consists of subtropical lowlands, but also includes the southern rim of the Ifuno Plateau, and the heavily forested Palu Mountains. 80% of the populaion speaks Nacateca, 10% speak Faroi and 9% speak English. This lesre is divided into four distinct physiological regions that correspond to the distribution of the various peoples. 1. First are the coastal plains, comprising the western third of the lesre. Through this region cuts the winding Santri River, yellow, shallow, slow moving. At the mouth of the Santri River is an estuary that makes for a fine harbor. On the eastern bank of this estuary lies the hot, tropical, sprawling city of Santanier. English speakers knew this city as Santanger. 2.3 million people live there. The majority of the population is Nacateca. However, Santancier is one of the most cosmopolitan cities of Bergonia. It is home to most of Bergonia's film industry. It is also home to many English remaining from the 1800s, and Latinos and Blacks who migrated throughout the 1900s from the Caribbean, Cuba, Brazil, and Colombia. Santancier is a stew pot for music, where melodies, rhythms and dance steps from the third world come to meet and mingle with Bergonian flutes, timpanis, horns and choirs. It is Bergonia's equivalent of Miami. Little rain and few storms occur to interrupt the tranquil blue skies of the area, except for the rare but violent hurricanes that come in the late summer. Incuatati is more likely to suffer from hurricanes than any other area in Bergonia. Along the western coast of Incuatati, west of the Santri River region is a plain called Kings Coast, designated as a Zhubo for English citizens. Kings Coast Zhubo consists of a number of small agricultural villages of English Anglicans. They make their living from fishing along the coast, raising cattle, and growing tobacco for export. 2. Second is the Palu Mountains, three chains of mountains, volcanic in origin, geologically very young, with three active volcanoes. The average height of the ranges is 3,000 to 4,000 feet, with peaks as high as 5,500. This mountain range rises up right off the floor of the coastal plain. The Palu Mountains catch a lot of rain, and therefore are covered by dense broadleaf subtropical forests. The lush mountains are home to Nacateca speakers whose major avocations involve timbering, coffee, tea and mining. The main chain of mountains run from east to west, parallel to the Cresner Bay coast. Two ranges of the Palu run north and south and form the eastern boundary of Incuatati. 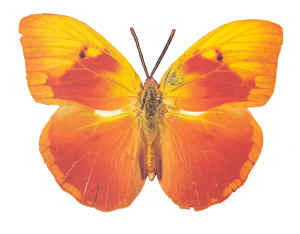 These are also called the Butterfly Mountains. 3. Third is the narrow plain along Cresner Coast bound tightly to the north by the main range of the Palu. These plains are crossed by fast-running streams that drain the mountains. Although the sheltered plain itself receives little rain, these streams make for verdant growth. This region thus produces prolific citrus crops. The golden beaches along this area are wide, white and picturesque. Palm trees abound. A number of small villages crowd along this coast that prosper from the fishing of tuna and entertaining of inland tourists. Most of the people who live along this plain are Nacateca who speak the Southern Dialect. However, in most of the small towns there are substantial minorities of English. One city in particular is majority English, Grove City, which has become a principal tourist attraction due to its gambling casino, the Comfort Hotel. The Comfort began in the 1720s as a small gentile beachfront hotel catering to the English colonial elite with a taste for gaming. It has survived successive wars and tumult, and has grown to a sprawling five thousand acre complex. It still functions as one of the world's great casinos, stoutly maintaining its proper English elegance. Within the complex is an exclusive beachfront salon, the Georgian Arms, which attracts Saudi princes, American movie stars, and corporate heads from all over the world. They all find relaxation at this socialist worker-owned enterprise. 4. The final region is in the northeast and consists of the foothills that fall away from the north side of the Palu Mountains. This region is called Puelelo. It is home of the Pueleloi, one of the Faroi people. These people, like all the Faroi nations, grow their hair long and tie it back with either ribbons or in braids, both the men and women. They are partial to greens, yellows, and reds in all their arts and dress. They celebrate many holidays with folk dances involving circle dances, timpani drums, guitars and lutes. They boast that they make the best cornbread in the country. The word Puelesha refers to the very popular honey and nut cornbread fritter, indicating its origin here. These people here have adopted for their symbol the ocuei, the small parrot, no larger than a bluejay, that manages to live in the sparsely forested lowlands. After Sanraniclai, Lampanira is the second most sparsely populated lesre. The geography of this big sprawling lesre greatly varies, for it is here that the Ifuno Plateau breaks apart and in a variety of geographical formations the land descends to the southern plain. A large part of the state's territory is included in the flat, fertile Umanoi Basin. Lampanira depends on agriculture and herding for its prosperity. Here is the home for much of Bergonia's beef industry. 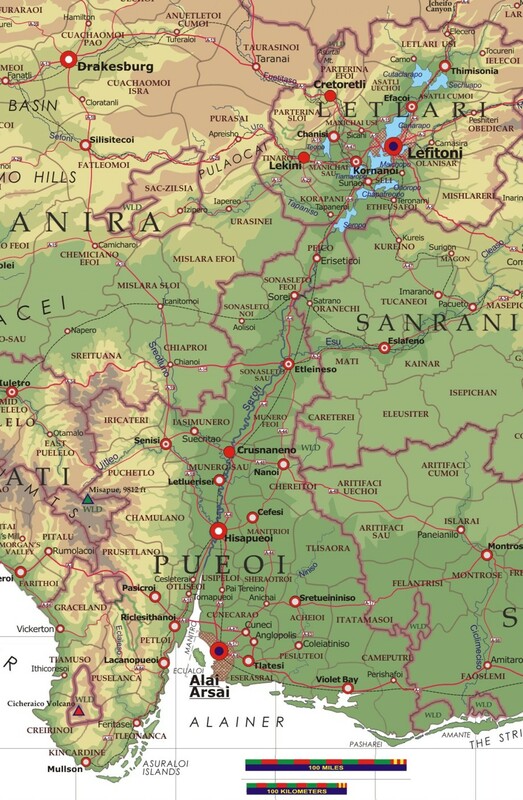 Lampanira also grows much corn (in the lowlands south) and wheat (in the upland north). 67% of the population speak Nacateca and 23% speak English. Its capital is Drakesburg, a city founded by the English colonists in the mid-1600's. Originally named Serenity, it was later renamed in honor of Arthur Drake, a leader of many colonial expeditions into the interior and a nephew to Sir Frances. Drake later became the governor of the Dean Company and became one of the most important Englishmen in Bergonia of his time. Drake loved the town of Serenity and came to spend much time there, although it was inconvenient to his duties. 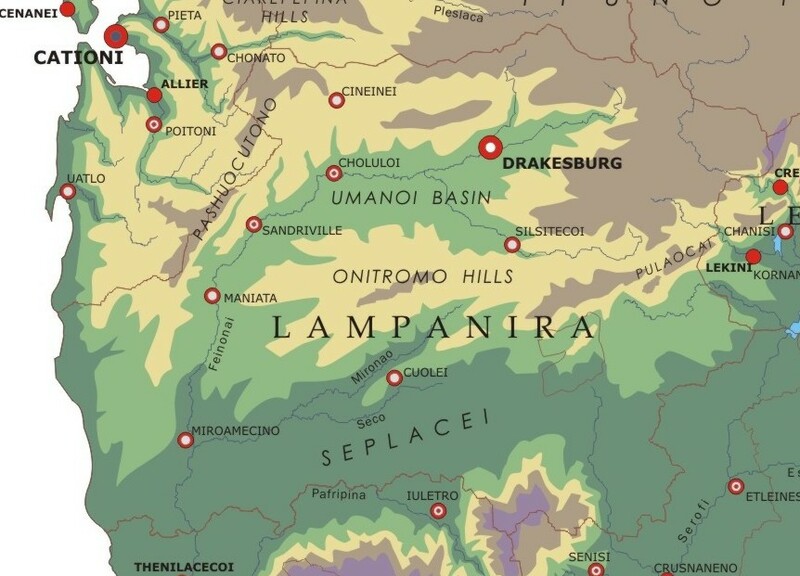 Sac-Zilzi: In eastern Lampanira is an enclave of Minidun speakers who emigrated westward from Zilsi in the early 1600s. These Zilsi natives fled west to escape the imprecations of the French settlers and the recurring plague. Of course, these Minidun were not welcome by the native Nacateca, but there were too few of them to resist. The Zilsi have occupied their enclave now for over three hundred years, and they coexist well with their Nacateca neighbors. In southern Lampanira, not far from the border with Incuatati is the remarkable Uretlenisia Crater, the largest intact crater on the planet Earth. There is no doubt as to the meteor that sped out of the heavens on a starry night in the year 649 A.D., red and furious, and exploded in the desolate Lampanira countryside, obliterating a small farming village a village named Uretlenisia. Bergonians had already achieved a highly literate level of civilization by the time the meteor slammed into the plain, and scribes and priests went to great pains to record what they could of it. A remarkable account of what five eyewitnesses saw survives. This crater has a diameter of 3,100 feet and is almost perfectly round. Walls of stone and dirt stand at their highest 130 feet high, and the floor of the crater is 35 feet lower than the surrounding plain. A small stream curls around the outside of the crater walls. The surrounding country is good agricultural land-- this is the country's corn belt-- with erratic but usually ample rainfall, originally forested. Letlari is located in south central Bergonia. Its capital and largest city of Lefitoni is also the primary capital city of the nation. It is also the second largest city in Bergonia. 89% of the population speak Nacateca. Lefitoni, for the most part, encompasses the upper Serofi Basin, the northern extreme of Bergonia's big southern plain. The shallow Letlari Lakes are the most significant feature, formed in a flat plain through which the Serofi flows. This plain has good productive black earth, and supports corn and soy farming. The basin is surrounded by foothills, escarpments, shelves and outcroppings, part of what's commonly called the Sunto, the descending formations along the southern edge of the Ifuno Plateau. The Sunto, comprising the northwestern, northern and eastern parts of Letlari, rise up unevenly from the level of the plain, about 300 feet, to the edge of the plateau, over 4000 feet above sea level. This land is forested, very heavily in sections. Lefitoni is located amidst several large beautiful lakes that together are drained by the Serofi River. Here in this sprawling city live 7,731,00 people, more than seventy percent of the lesre's total population. Lefitoni's history is not near as estimable as those of Ceiolai, Patalani and many other cities with ancient pedigrees. The city of Pula was founded in the 500s under the auspices of the Second Ceiolaian Empire as a settlement for Ceiolaian colonists and relocated persons from the Crisitoni area. Though located well within the Nacateca half of the country, to this day Lefitoni has a large Minidun presence, and there has been centuries of intermingling so that the physical types have thoroughly blurred. In the medieval period Pula remained a small city, capital of a small principality of little importance. In Tanic times people from the overpopulated areas of Cuecha settled there, concentrating in a new town called Lefitoni, adjacent to Pula. By the time Columbus had arrived Lefitoni had became larger than Pula, although the two essentially constituted one city.. The country around the "Lakes of Letlari" was fertile, and the lakes themselves offered a generous bounty of fish. In colonial times the reputation of Lefitoni was enhanced because it was relatively untouched by the horrible plagues that killed most of the natives. During the 1800s Lefitoni grew quickly, primarily because of its superb position as a transportation hub and its proximity to natural resources. Boats sailed up the Serofi River from the port of Alai Arsai in the lesre of Pueoi all the way to the lakes. The boats docked at Lefitoni and there overland transportation began into the interior of the islands. In the last two centuries Lefitoni has benefited greatly from modern planning. The first plan was contrived under Rarsa's rule when Rarsa intended to transfer some of the operations of government there out of crowded Ceiolai. The planning was conducted by a commission of local and nationally appointed architects and engineers. After the Revolution in 1936 the government centralized around the city planning commission, originally an adjunct to the city council. The planning commission undertook a massive construction project to locate the new national capital there. After the revolution most of the organs of government were moved to Lefitoni, and it was recognized as the new capital city of Bergonia. The decision sparked great controversy, and debate ensued with acrimony. The government itself contended that Ceiolai was too crowded and the individual government buildings were too small and cramped to permit expansion or efficiency. Plans for new facilities in Ceiolai entailed clearing out many of the older neighborhoods, but the Ceiolaians would have none of it. Indeed many Ceiolaians, when confronted with the plans, were happy to see much of the government go. Congress, the Pacunot and the Executive Council sit in Lefitoni. The military headquarters is in Lefitoni. However, most of the economic ministries are located in Ceiolai. The Pacunot is inaugurated in Ceiolai, recognizing the office's historical roots in Ceiolai. The great inspiring landmark in central Lefitoni is the Light Mast, a great tower constructed of white marble located in a beautiful park flush with flowers on the shore of the lake. The Light Mast is a slender tower, 830 feet tall, broader at the base than at the top, and curving gently upward in an irregular form. At its top is a flame, fed by natural gas, which burns throughout the day, every day and every night. The Light Mast was built in the 1940s and expresses a modern style. It was built to commemorate the revolutionary spirit, and has become a national symbol, much as the Statue of Liberty is for the USA. Beside the Light Mast Park, along side the lakefront, is the Congress House, built in the 1940s, where the Congress meets. The building is made of marble and glass, the roof of red tile. The lines are clean and simple. The windows are huge, all arching, with a large portico on each side. The chamber in which Congress meets is unique for legislative chambers, for one entire wall is comprised of glass walls that allow the delegates to overlook the lake as they deliberate. The architect said, "Perhaps the sight of the cool calm waters will still the hot ardor of the politicians' debate. Another great landmark in Lefitoni is the great statue of John Rarsa, the great dictator who ruled Bergonia for twenty years in the late 1880's. The statue is located on the Feraco Center, along Grand Central Avenue. The old downtown of medieval Lefitoni is largely still intact. It is centered around the Arcade. This is a long building that is an indoor market. Inside are two stories of stores and tall vaulted ceilings, with plenty of decorative arches. The oldest part of the Arcade was built in the late 800's. A much larger addition was built in the 1400's. Since then the Arcade has been well maintained over the centuries. The Arcade is almost a mile long, one of the most impressive older structures in the nation. it is still used as a market, although the stores allowed inside are limited to small shops for clothing, jewelry and collectables. Another medieval landmark in Lefitoni is Setraomita's Arch, built around 850 A.D. It was a huge memorial arch built of marble, but it has not survived well. The central arch still stands, but several of the smaller arches which comprise its complex structure have collapsed. Once armies marched under its main arch, but now it is fenced off. Lefitoni is a modern city. It is one of the only cities in Bergonia where any number of skyscrapers have been built. For the most part, Bergonian planners and architects have rejected the skyscraper style, as have most of the Europeans. Lefitoni is a notable exception. It is home to the nation's tallest building with 68 stories, called the Law Tower. The elegant club and restaurant on the top floor, the Stratosphere, is one of the hardest places in the city to get reservations. One of the three great rivers of Bergonia, the Serofi River, flows from the center of the Ifuno Plateau, southward across the wide coastal plain, and into the sea at a huge estuary called Manitro. 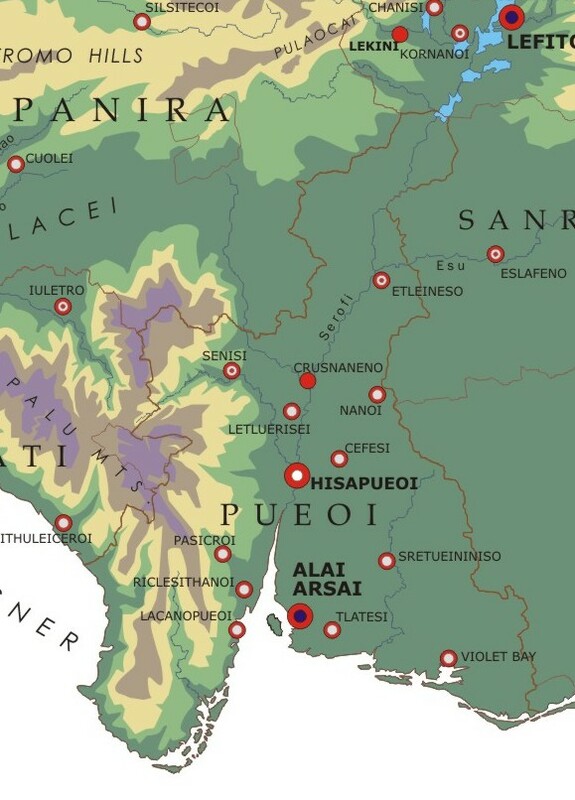 The territory on either side of the Serofi and the Manitro is organized into a lesre named Pueoi. Except for the western part of the state, on the border with Incuatati that follows the ridgeline of the Palu Mountains, Pueoi is very flat. Most of Pueoi was originally grassland. It now is almost fully developed into large communal farms that produce cotton, corn, and tobacco. The southwestern part of Pueoi is comprised of the extreme eastern reaches of the Blu Mountains. This area collects a lot of rainfall. Pueoi has a self-confident and strong identity. 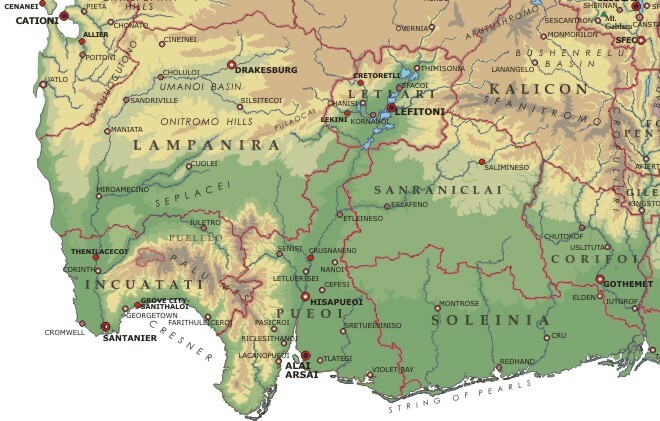 Now a lesre in the national entity, Pueoi was for centuries an independent state, one of the most powerful states in ancient and medieval times. Pueoi always counted for a great deal in medieval politics and came close to becoming the dominant state, save for the devastating hurricane of the year 882 A.D., which destroyed the capital city, Alai Arsai, and utterly wrecked the Pueoian nation. In colonial times the British subjugated Pueoi, but not with a military victory. The victory was diplomatic, and the Pueoi people allowed themselves to fall under British rule when the British in turn agreed to give them broad autonomy. It became a practice the British repeated in India and Africa. Few other native ethnic groups embraced European culture as enthusiastically as the Pueoi did, as they absorbed British manners and customs. Pueoi remained under British rule until 1830, and adopted English as its official language. Even after absorption of Pueoi into the independent Bergonia republic, British customs prevailed. The state government started building a system of public schools earlier than most other states. English was the language of instruction. The bourgeois atrei of Pueoi took tea in the late afternoon. The Pueoi are typically exuberant and friendly. They love nothing more than a good dance and a wild celebration. However in their politics they show a calm and conservative temperament. The Pueoians have generally always supported the more moderate tendencies in Bergonian politics. They usually give their majorities to the SFP. The Pueoi speak their own dialect of Nacateca. Their dialect is also spoken by the atrei of Soleinia and Sanraniclai, regions the Pueoians settled in medieval times. 82% of the population speak Nacateca, 3% speak Faroi, and 11% speak English. The capital city is Alai Arsai, situated on the east bank of the Manitro, the big bay into which the Serofi River flows. Alai Arsai has a population of 3,700,000. The city has a large harbor, protected from the open sea by a large island called Cesao Arsai. The Serofi is navigable from its mouth, where Alai Arsai is, all the way beyond the final border of Pueoi to Lefitoni. Thus there is much riverboat traffic and ocean ship traffic, making Alai Arsai a great trading and commercial center. Alai Arsai was founded in medieval times when the Pueoi nation first began its ascendancy. In colonial times British interests concentrated there. In the early 1900s Alai Arsai was a bustling city, chaotic and confused like practically all the other Bergonian cities. The Revolutionary fighting of the 1930s was intense in Alai Arsai, and neighborhoods were destroyed by the resulting fires. To make matters worse-- much worse-- a devastating hurricane smashed the area hard in 1939, just as post-war rebuilding was concluding. The eye of the slow-moving hurricane passed over Alai Arsai. Hard winds and torrents of rain caused great destruction and a death toll of 7,300. The floods left large parts of Alai Arsai and the surrounding countryside under water. Over a million people lost their homes in south-central Pueoi. Therefore, in the aftermath of the hurricane, the government proposed a great rebuilding of the city. It was proclaimed that "Alai Arsai will be the spatial embodiment of our revolutionary principles." The national government committed millions to the task. Architects from around the world, including Le Corbusier, were consulted. More importantly, the planners consulted with the city residents in a repeating cycle of publications and public meetings. The process was hectic, uncentered, and very lively, until a committee of eight architects and builders was authorized to pull all the plans together. After a referendum, construction commenced in late 1942, and in 1955 the project was formally deemed concluded. The resulting plan consisted of a spacious geometric layout of wide tree-lined main commercial streets, punctuated by major plazas, reflecting pools and parks. The interstices were filled with residential neighborhoods, each centered around a small plaza. Residential zones were located close to industrial and commercial zones to reduce commuting time and preserve neighborhood cohesiveness. The plan was significant for its absolutely lack of large apartment buildings. For the most part, the plan stuck with the traditional practice of limiting residential buildings to four stories and commercial buildings to six, except for a complex of skyscrapers constructed in the downtown, all built in the same style, with the tops of each one tapering into spires. With an eye on Hitler's Autobahns, the plan anticipated the need at some time to construct superhighways. Accordingly, intra-city expressways were built in the 1960s. These highways still adequately handle the traffic in the 1990s. Possibly the most important feature was the system of levies, open park lands and storm sewers to handle run-off of huge masses of water, a necessity for a city periodically slammed by hurricanes. The Planning Council created in 1941 still exists for the purposes of preparing, revising and supervising five-year updates to the plan. Like all Bergonian cities, this city consists of neighborhood communes, with elected ward councils that function much like autonomous municipalities. Every five years the communes and ward councils are asked to give their suggestions for updates of the plan. The Planning Council has a representative at every council meeting in every ward, and planners visit every commune once a year. In the peculiar manner of Bergonian federalism, the wards are empowered to opt out of most parts of the plan and devise alternatives. Only matters pertaining to flood control, building codes and utility infrastructure are absolutely binding on the wards. Once a year every citizen receives in the mail a packet from the planning council, detailing the proposed updates, and including a questionnaire asking for opinion, suggestions and priorities. The responses are tabulated and published, and used in assigning priorities to the various factors used to evaluate the various proposals. Thus Alai Arsai's growth throughout the past half century has been controlled, with splendid results. For this reason Alai Arsai is unlike more typical Bergonian cities, such as Ceiolai, Glen or Cationi, which are riotous mish-mashes of big projects and winding streets, where old and new crowd together in delightful confusion, fusing to produce a cohesive whole. Some people prefer the planned modern cities of Alai Arsai, Bergonia Tunec (see Dhentamina) and Lefitoni, while others prefer the random kind. By and large, Alai Arsai is universally regarded as one of the best examples of comprehensive urban planning of all time. Sanraniclai, located in south central Bergonia, has the lowest population density of all the lesre. The population is 2,386,000. 75% of the population speak Nacateca, 17% speak Faroi, and 3% speak English. The south of Sanraniclai is flat, part of the Beinton plain. The plain receives only modest rain, allowing only grass and shrub, with trees limited to the banks of rivers and streams. Because the amount and frequency of rainfall increases incrementally as one travels from east to west, southwestern Sanraniclai has denser cover, with woods interspersed among the grasslands. This entire country is excellent for cattle grazing. Before Columbus this country was sparsely populated, with few towns and no cities, given over to the Faroi people under protectorates of the Pueoi state. The English colonizers brought cattle and established large cattle stations in the interior. The northern portion of Sanraniclai consists of ranges of hills spreading southward from the Sfanitromo Range in Kalicon. The mean altitude of this area is 1500 feet. The hills generally run from the northeast to the southwest, decreasing in altitude toward the southeast until they end. This is the Sunto region, where one finds tangled thick growth of laurel and other broadleaf evergreen trees. Quite a few of the Faroi people still live in Sanraniclai. Most of these people are mixed Nacateca and Faroi, with even some English and Minidun strains. The traditions of Faroi string music and the peculiar dancing style-- the Ibragu, much like clogging interspersed with leaping-- are still popular. They maintain strong ties to their Faroi brethren in the states of Soleinia and Incuatati. Soleinia (once spelled "Solania" by the British), located along the southern coast, consists entirely of flat coastal plain, called the Carolei, a dry expanse of shrub, grass, thorn trees and succulents. It is perhaps the poorest of all the lesre, underpopulated, without large cities, and with meager natural resources. The red earth receives less than 25 inches of rain a year, with most of it coming in summer and autumn thunderstorms. However it is now the home of the Supercollider, an expensive, prestigious national project. 61% of the population speak Nacateca, 11% speak Faroi and and 24% speak English. 1. Long slender barrier islands run parallel to the coast, now called by the English name, the "String of Pearls." These islands are desolate sandy places, with broad white beaches, the most beautiful beaches in the country, with sand dunes, sea oats, and short scrubform, and salt water marsh on the sound. The small towns there, populated by both English and Nacateca speakers, welcome tourists, but the natives are committed to keeping the development to a minimum. So rather than the String of Pearls being a place of swanky hotels or resorts, tourists come here to stay in small inns and rental beach houses, or to camp. 2. Narrow, calm sounds separate the islands from the mainland coast, where one finds deep, dense and intimidating mangrove forests, and the nastiest swamps in the country. Along the coast, the population-- such as there is-- has settled on the islands where they have traditionally lived off the shellfish and fish from the inlets. The atrei native to this coast have always had the insane sport of alligator wrestling, and they eat gator tails as part of their regular diet. The swamps are so inhospitable that very few will live in them, so they have always attracted fugitives and spooky characters, at least in the popular imagination. In the 1600's and 1700's pirates, both English and native, operated out of secret bases located in this wild, complex coast, where one could easily hide. 3. No more than ten, twenty miles inland one emerges from the mangrove forests onto the dry Beinton plains, covered with grass and an abundance of shrub species and small , with trees clustered along rivers and streams and in occasional patches. This is 85% of the Lesre's land. The level of precipitation is enough to permit the farming of sugar, and indeed Soleinia is Bergonia's largest sugar producer. Cotton and tobacco are grown here as well, but Soleinia's productivity in these pales next to that of the three states to the east, which have the benefit of several big rivers that allow irrigation. In colonial times English settlers herded cattle in the dry, open countryside, and beef cattle is still an important part of some local economies, for centuries exporting its beef to British and European markets. English and Scottish settlers came to Soleinia after the plagues wiped out as much as 95% of the population. The capital and the largest city, Redhand, with a population of 380,000, was founded by English settlers in 1632. Redhand was once an exclusively English city, strictly segregated, but with time Nacateca-speaking atrei have moved there, attracted by the industrial and longshoremen jobs that Redhand came to offer. Now the Nacatecas comprise a majority of the city's population. Redhand is located on the wide estuary of the Peteitlora River. This wide shallow muddy river is navigable all the way to the Sanraniclai border and small flatboats use it to bring crops of tobacco, sugar and cotton down to Redhand for processing and shipping.